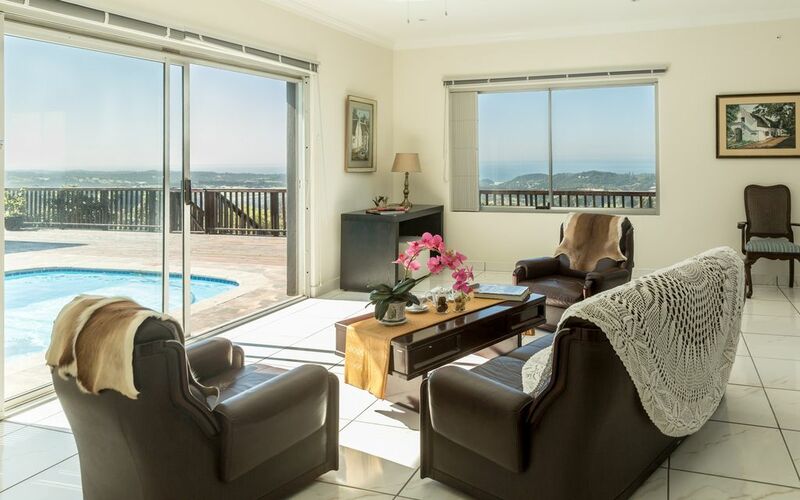 Villa Doré is located in a small resort town named Port Edward on the south coast of KwaZulu-Natal in South Africa. villa dore has six up-market rooms, a fan, tea and coffee facilities as well as a dining area, bar, and an open-plan lounge area leading onto the swimming pool and overlooking the beautiful ocean. There is also a braai area and a parking on the premises. Port Edward has many activities and attractions such as hiking trails, cycling, fishing, scuba diving, wake-boarding, and Wild Waves Water Park. There are also 3 beautiful golf courses near by. There are great restaurants around. We moved to South Africa from Japan. I am a Japanese and my husband is a South African. We bought this macadamia nut and banana farm 3 years ago. The farm house was renovated to be this beautiful villa with a spectacular view. My husband is doing organic farming and trying to spread this way of farming. We make value added product in our factory from our produce (green banan crisps, macadamia honey spread etc. )which we will be happy to introduce to you. We are in a macadamia nut and banana farm so can provide a farm tour. We manufacture green banana crisps in this farm so can giva a packet to try.